Fortune Magazine has written a piece about Apple headquarters, and it is just the kind of crazy dictatorship / creative wonderland we've always imagined it to be. While we're an Android site, that doesn't mean we're not intrigued by what's going on across the slim, white, glossy picket fence. You'll have to pay to get the article but we've found a lot of its fascinating details by scrounging around online. The executive who runs the Apple online store has no control over the photographic material that goes on the website. Apple’s graphic arts department creates and chooses and photographs. 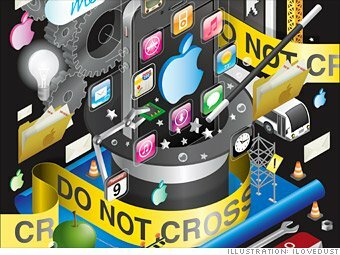 Once a project is nearing completion, Apple spends whatever they need to make it perfect. For example, they contracted the London Symphony Orchestra to record the iMovie soundtracks; they sent a camera crew to Hawaii to film a demo video for a wedding scene; they even staged a fake wedding in a San Francisco church to get a different take on the video, with Apple employees playing guests. The creative process at Apple is one of constantly preparing someone — be it one’s boss, one’s boss’s boss, or oneself — for a presentation to Jobs. He’s a corporate dictator who makes every critical decision — and oodles of seemingly noncritical calls too, from the design of the shuttle buses that ferry employees to and from San Francisco to what food will be served in the cafeteria. Jobs imagines his garbage regularly not being emptied in his office, and when he asks the janitor why, he gets an excuse: The locks have been changed, and the janitor doesn’t have a key. This is an acceptable excuse coming from someone who empties trash bins for a living. The janitor gets to explain why something went wrong. Senior people do not. “When you’re the janitor,” Jobs has repeatedly told incoming VPs, “reasons matter.” He continues: “Somewhere between the janitor and the CEO, reasons stop mattering.” That “Rubicon,” he has said, “is crossed when you become a VP. Meeting rooms are swept for electronic bugs likely placed by “snooping competitors”. The article also describes one of Jobs's infamous meltdowns, this time directed towards underlings who had messed up the MobileMe platform. "Can anyone tell me what MobileMe is supposed to do?” Jobs fumed. Having received a satisfactory answer, he continued, “So why the f*** doesn’t it do that?